Adolph Hahn came to London with his young family as refugees from Germany. He founded Hahn restorers in 1870 at premises in Soho and London and has remained the home of the business ever since that date. The restoration business appears to have prospered and by the 1920’s Charles Hahn, Adolph’s son, was head of the business and had acquired a considerable reputation for skill and expertise. Many of the prestigious commissions for work at the time came to Hahn Restorers including the restoration of the ceiling at the Mansion House, Whitehall in London painted originally by Sir Peter Paul Rubens in 1636 and the only survivor of the disastrous Whitehall fire of 1698. This was a long and complicated task involving restorers working from scaffolding created beneath the ceiling. Other famous collections, which they worked on, included Castle Howard, Yorkshire and Tatton Park, Cheshire. See the photo above, Charles Hahn seated and his two sons standing behind him circa 1929. 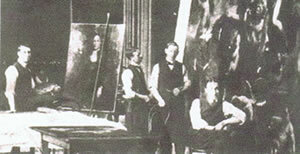 Charles Hahn’s eldest son, also called Charles came into the business in 1925 followed by his younger brother Sidney in 1927 both having been to the Putney School of Art. When the elder Charles died in 1938 the firm occupied a four storey building in Soho, central London and there were more than twelve restorers working fulltime. In 1939 when World War II started Sidney joined the Royal Navy and by 1946 when he was demobbed be had achieved the rank of Commander. Charles joined the RAF becoming entertainments officer at RAF Melksham. The building in Marshall Street, Soho received a direct hit during a German bombing raid. The bomb went through all four floors and destroyed everything including hundreds of paintings. In 1946 Charles and Sidney started Hahn restorers again, initially from premises in Brewer Street, Soho and then at 47 Albemarle Street, Mayfair – a short distance from The Royal Academy, the great London auction house of Sotheby’s and Christies and the heart of the artistic establishment in London. Charles Hahn died in 1976 and Sidney Hahn in 1986. Both were well into their seventies and still working as restorers at the time of their deaths. Sidney’s only son Paul took over the business where he had spent most of his working life and trained as a restorer with his father and uncle. Paul did spend a period of several years working for Sotheby’s early on in his career gaining a wide knowledge of the art trade and the pictures that were brought and sold in numbers unimaginable today. Paul has continued the restoring business based in London and Surrey. He has over 35 years experience as a restorer and an extensive knowledge of European and American paintings and painters. Since 1964 Paul Hahn has worked regularly on the collection of paintings at Blenheim Palace home of the Duke of Marlborough. Over the years almost the entire collection has been cleaned and restored from the smallest gems to a recently completed canvas measuring 13ft x 18ft showing The battle of Blenheim 1704. Clients have included private collections, art dealers from home and abroad, institutions both public and private Gentlemen’s London clubs and many other types of owners, large and small. Word of mouth recommendations combined with long history and the good reputation of the business have meant a constant supply of new and old clients even some clients who remember his father and uncle.